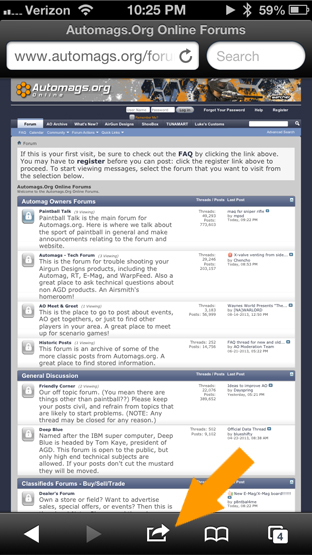 Hello - and welcome to Automags.org - THE place to be for information on Airgun Designs producs - and a great place to hang out and talk about paintball. Small Update: Added AO logo for iPhone users. Open Safari. Press the "share" button. Press "Add to Home Screen"
AO: How to search for 3 letter words. Here are a handful of quick reference guides to help administrate the CMS function in vbulletin. Want to be in the Banner? AO: Since it looks like signatures are back up, here are a few AO state sig's that JAM created a few years ago. edit*** 10 years ago.. Lol.